When I asked Nokia if I could review their 8800 Arte handset, I wasn’t quite sure what to expect. Some dumb phone that just looked a bit pretty, form and no function, a celebrity only famous for being rich? I’m certainly not the target of a phone like this. I like my mobile devices to be able to do everything. Surf the web, get emails, keep my calendar, mind my address book, and keep everything in sync with everything else. These are things that typically flumix a Series 40 phone. The first time I held this phone I was impressed by how heavy it was. Say wah? 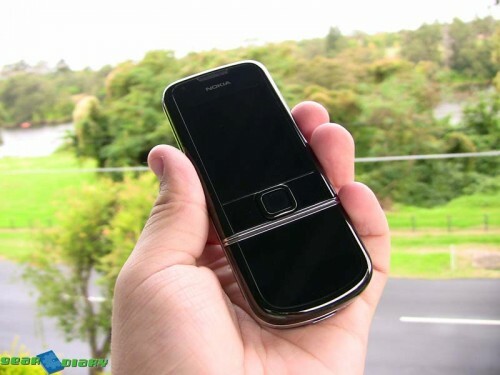 Yes, this phone isn’t light, despite its sleek physic and diminutive dimensions. All this weight comes from a complete lack of plastic ANYWHERE on this phone. No glossy plastic and fake chrome here, this phone is the real deal. A fabulous combination of stainless steel and glass make this phone unbelievably sturdy. You don’t have a hope in hell of finding a squeak, rattle or gap on the case of this phone. As some will remember I was less than impressed with the build quality of the original N95, to be honest it’s amazing that this phone comes from the same company. It’s even better than the Nokia E90, which up till now was the best built Nokia I have ever had the pleasure of using. The slider action is just as impressive. There is no flex, no slack, and no play in the slider on this phone. Every time you open or close the slider on the 8800 Arte, it gives a satisfying click as it locks into place, and it will firm, not flopping about like the N95. The design is just so achingly elegant. There is no screen visible on the front, no buttons on the sides, and a very understated camera lens on the back. Despite it’s small size and lack of features, it’s very heavy. This is due to the stainless steel and glass construction, and it’s fantastic. I have never had a phone that has such extraordinary build quality as this. It’s the attention to detail that gives this phone such a high price tag. Not only is it build with top-notch materials, but the little things have been thought of as well. When the phone rings and you need to silence it, you don’t need to press buttons, just flip the phone over on its face and it will be silent. Double tapping on the front of the phone brings a golden analog clock to the surface, which disappears after a few moments into the black. The soft leather slip case is a really nice touch too. To get the phone out, just pull on the little tag and it slides out, no fuss or fiddling necessary. I really like the Nokia 8800 Sapphire Arte, because it accomplishes exactly what sets out to do: Be subtly stylish, of the highest quality, and won’t flumix the non-technical people it’s aimed at. Now I have to send it back 🙁 It made a great pairing with the HTC Shift (which also went back…). What Needs Improvement: And you thought the Shift was pricey….